For exercise, on Sunday June 3, 2016, I walked up to the north summit viewpoint on Mount Gardner. 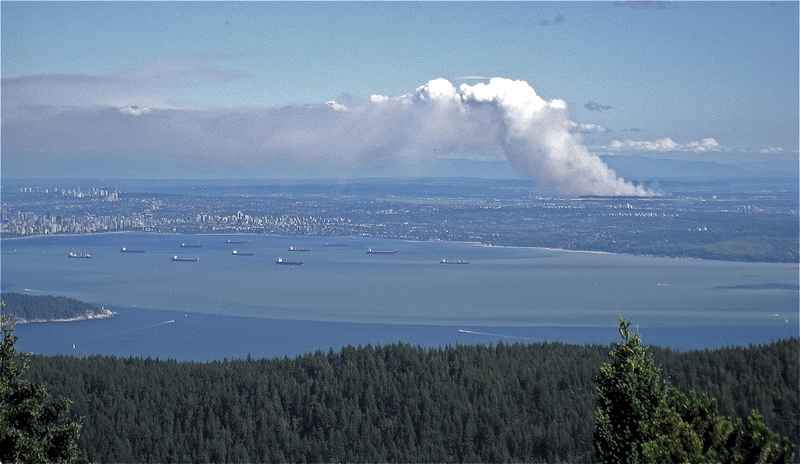 There was a huge plume of smoke rising from the direction of the municipality of Delta. I learned later this was Burns Bog burning and there were about 100 firefighters trying to contain it. In conditions like that, my old leather hiking boots would quickly become wet and much heavier, and my feet would become soaked and cold. With the runners, my feet never became wet. I was wearing two pairs of socks: a light hiking sock with some percentage of wool, and a thin liner sock. Probably one pair of socks would have been enough. My feet were always warm. This was partly due to the gaiters and pants that easily shed snow. 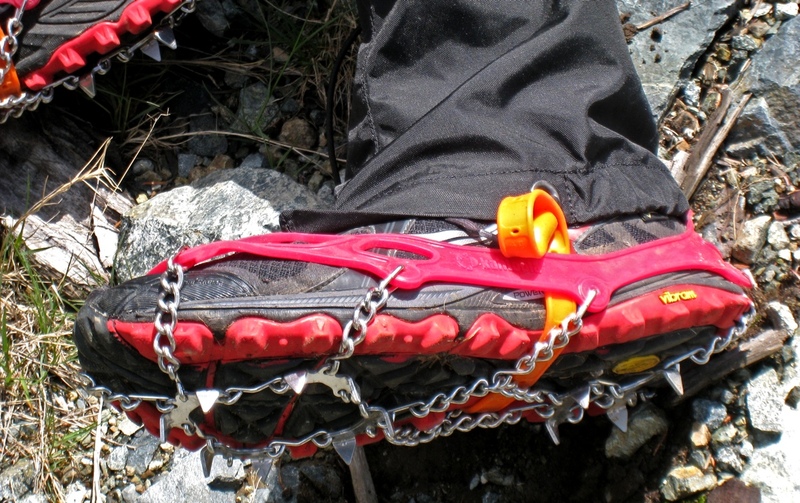 It was my first day using the Kahtoola Microspikes — and I am thrilled with them. I felt more secure on all slippy surfaces that I ever have with just hiking boots and a good Vibram sole. The big advantage to this aging hiker is that the weight on my feet is much less with runners than with any hiking boot. I’ll probably reach for my monster Montrail Verglas boots for a mid-winter trek on a very cold high glacier. But for most hiking, you’ll likely see me wearing those Saucony runners. In the year since I planned this system, Saucony have discontinued the Xodux 5.0 GTX and replaced it with the 6.0 GTX. I hope the new ones are made on the same last, and are as waterproof/breathable. MEC no longer carry the Istrum pants, and I don’t know what is the replacement. This was all purchased at Mountain Equipment Co-op. 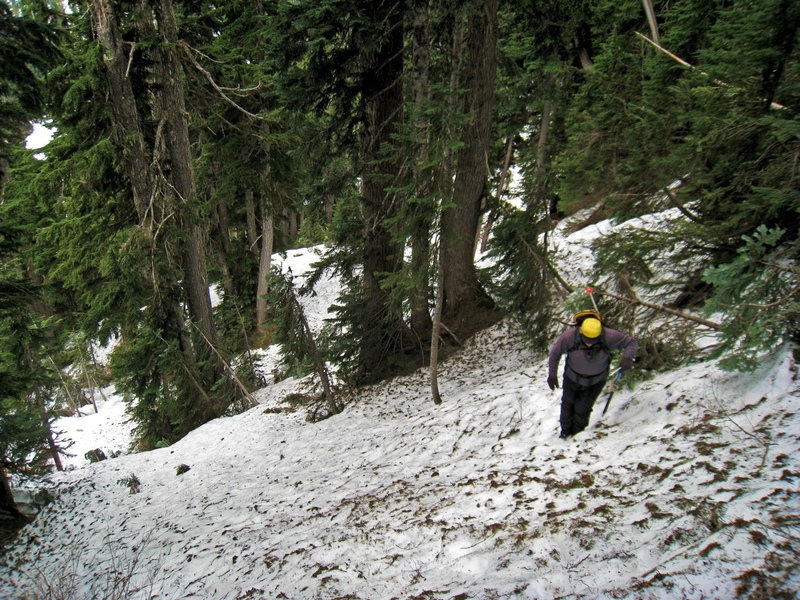 This season we are finding that some of the familiar routes to great spring skiing are no longer easily available. 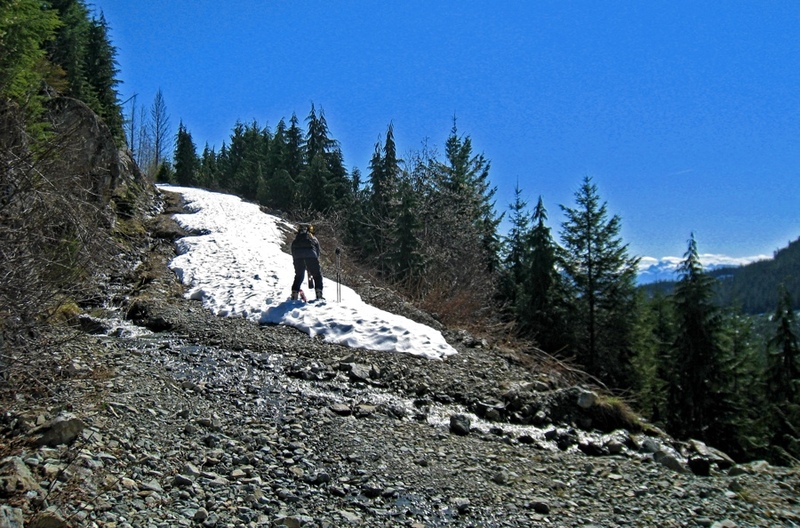 On March 19 we discovered that the road into the wonderful valley to the NW of Cloudburst Mt. was blocked by a recent collapse of a cliff (49.950275, -123.290549). We had a nice walk that day… but we were very far from Tricouni Meadows or the summit of Cloudburst Mt. and adventures we’ve enjoyed here in the past: Cloudburst from the Tricouni Trail. 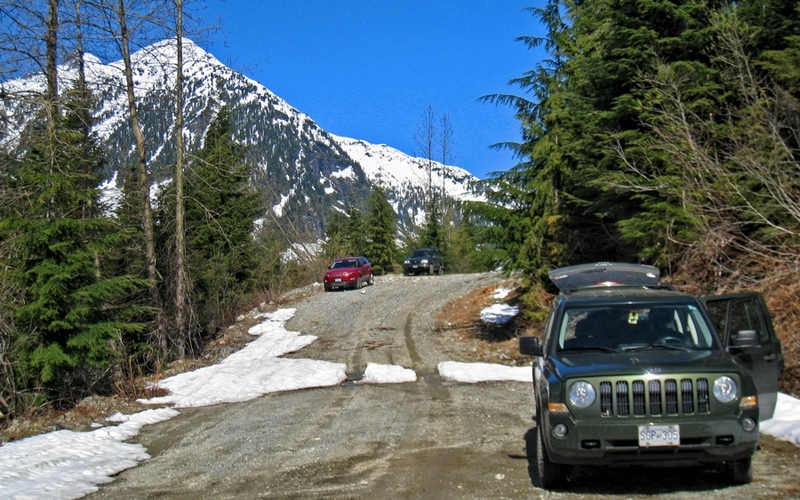 A reliable destination has always been the road to the head of Roe Creek, so that’s where we went yesterday. We made it only to the intersection with Branch Road 200 (50.010479, -123.205308). Three other cars were parked there, and we wondered why. Beyond this point, the road has been deactivated. Immediately beside this intersection, the road has been trenched to guide the water flow from along BR200 down to Roe Creek. Looking up BR 200 several mighty logs have been placed across the road as barrier. 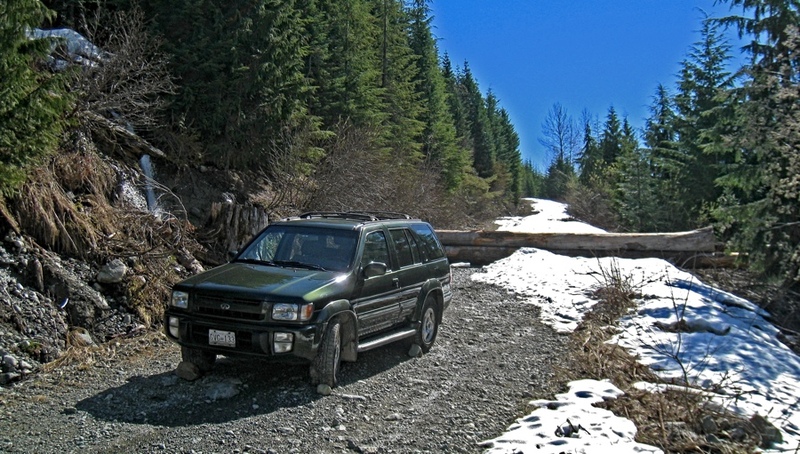 In the past couple of years, this has become the site of active logging. 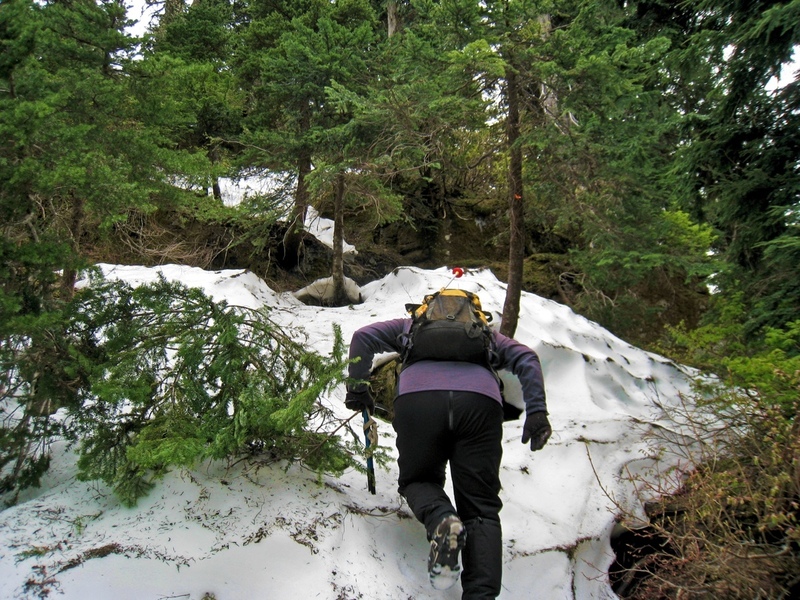 BR200 has been an important route for backcountry travellers because it leads to the trail to Brew Mt. Meadows and the Brew Hut. It was a warm sunny day, and we could see almost continuous snow on this road. 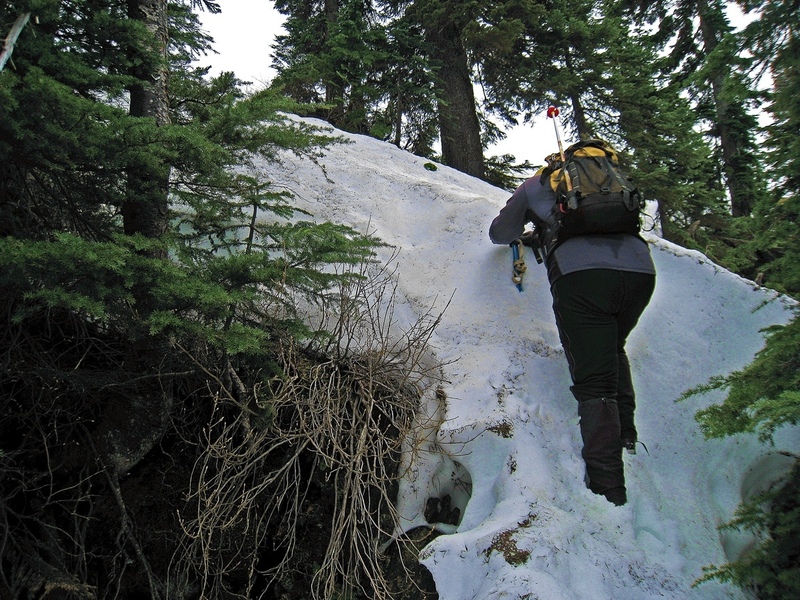 So, we tossed our skis over the barrier, and could snap into our binding right there and begin to skin up. 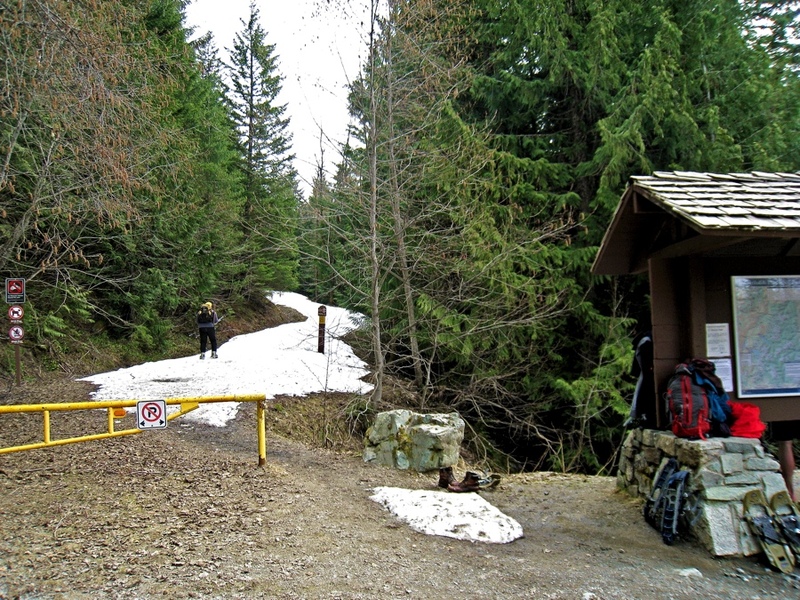 There were a few small open patches of road, but most of the way up we were on lovely soft spring corn. 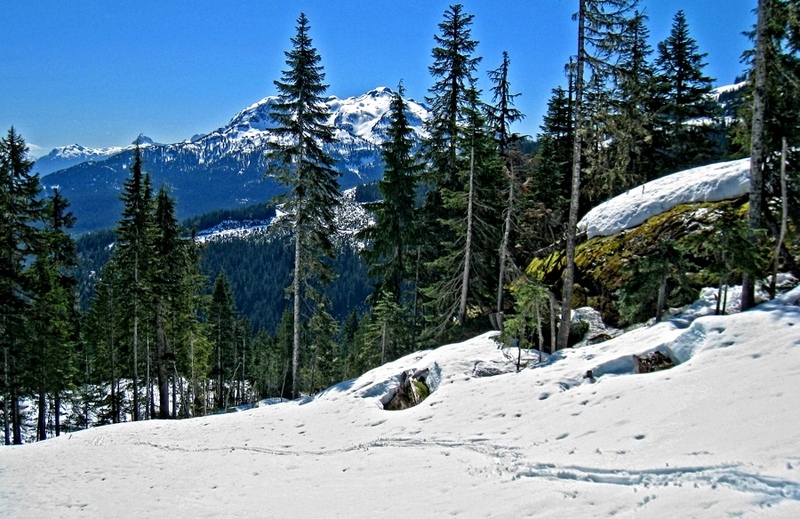 Above 3500 ft, the new logging clear cuts had enough snow on them for us to make a few turns and enjoy some great mountain views. That’s Cloudburst across the next valley. We’ve skied off the top of that, and it was fun to explore the gullies we’ve skied over there from this point of view. 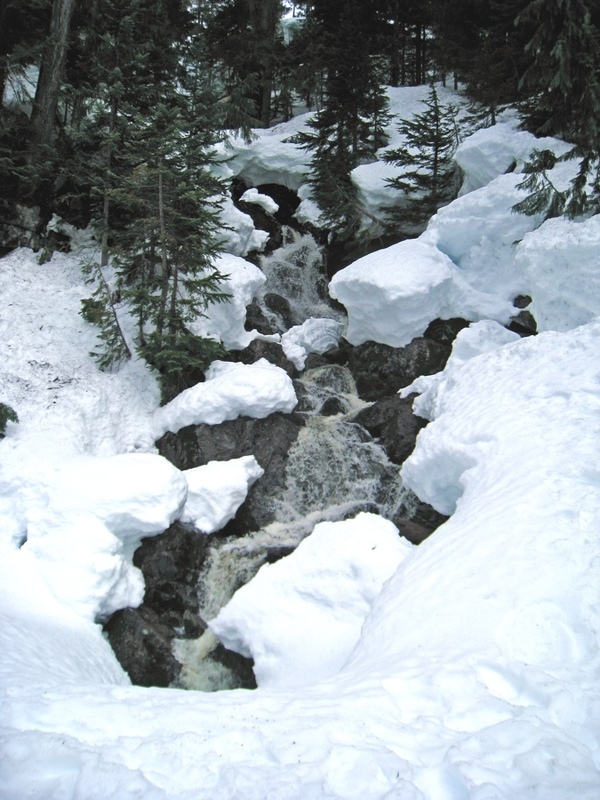 The weather has remained chilly, and we’ve had lots of precipitation lately, so there is a mighty snowpack somewhere up there. 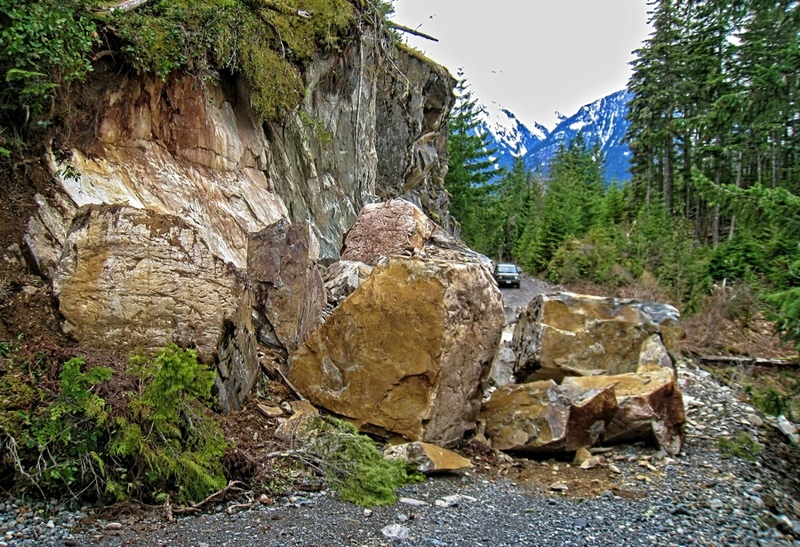 We took the Mamquam Road out of Squamish. 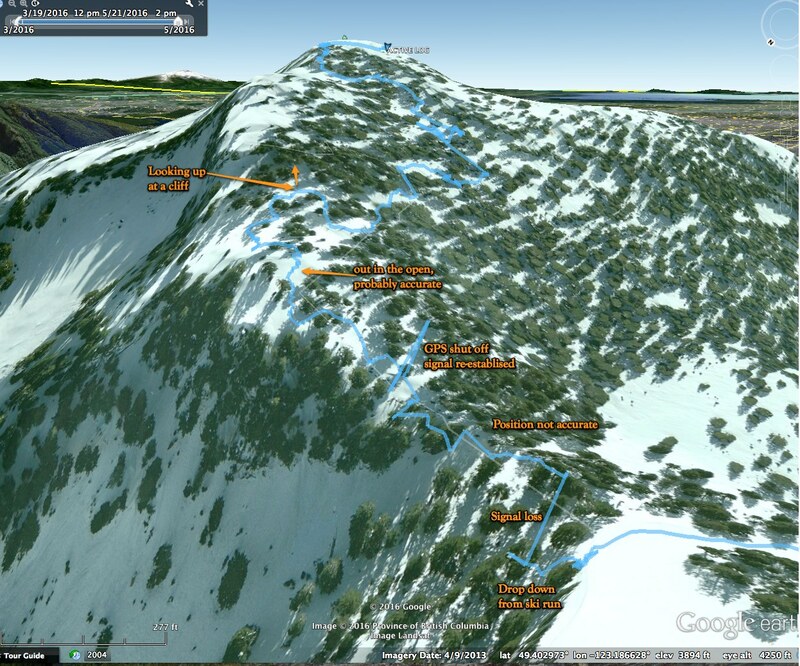 It provides the closest access to Garibaldi Park from Vancouver. Mamquam Rd. crosses Ring Cr. [elevation 71 ft, lat 49.733684°, long -123.114137°] and becomes a rough mountain road that climbs to the Diamond Head Parking Lot and Trailhead. The trailhead is at 3200 ft. [trailhead lat 49.750206° long -123.053084°]. There was almost no snow in the woods. 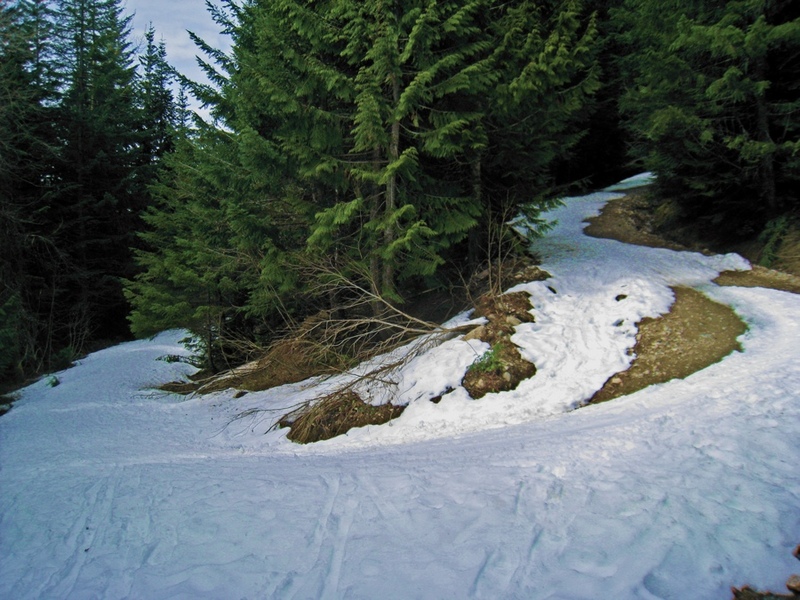 The trail is an old Jeep track, and because it is open to the sky it collects lots of snow. 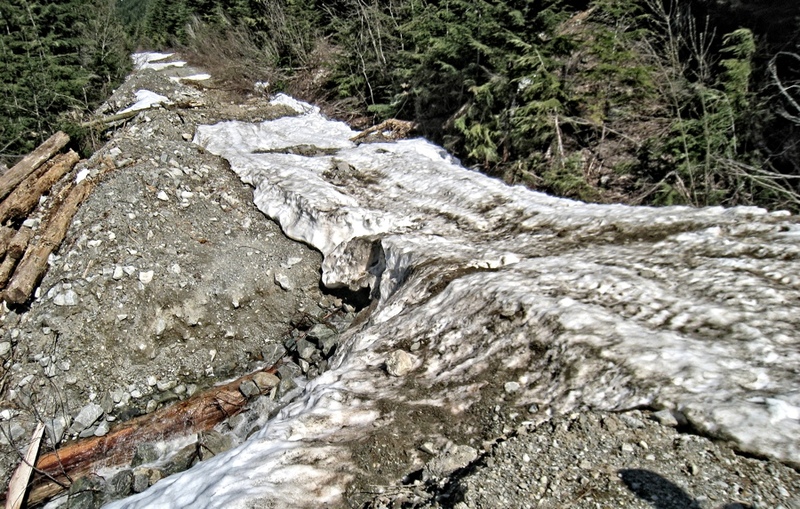 Well, the snow on the lower section of the trail has almost melted away. In some sunny places the trail was patched out and we stepped carefully over the rocky path with our skis. this is the first major switchback on the trail [lat 49.749963° long -123.047329° elevation 3698 ft]. 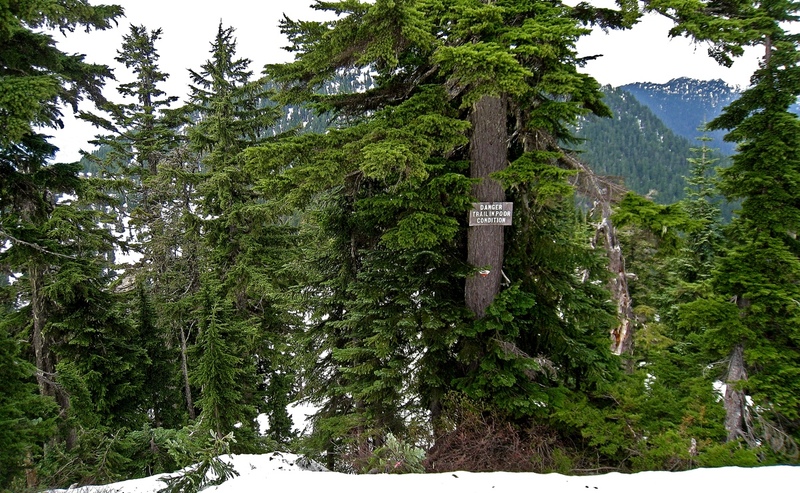 About one and a half kilometres farther, the track has climbed gently to the northern side of the ridge, and the skier is in old growth forest. Here there is lots of snow. I realized how much there was at the waterfall. We were only 800 feet higher than the parking lot [Waterfall, lat 49.761572° long -123.047500° elevation 4073 ft]. Conclusion: the snow is up there. And lots. 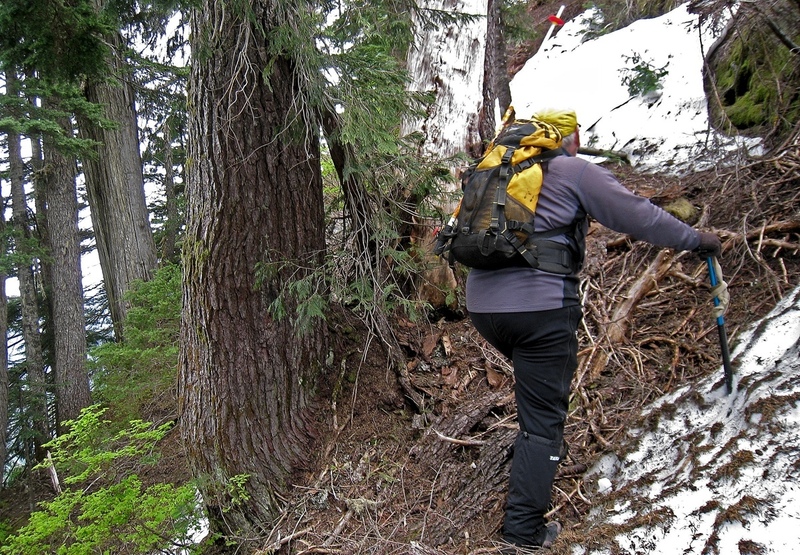 But count on climbing above 4000 feet to find it. Readers of this blog know I love radio drama — and my favourite stories are created by the ZBS Foundation. This week, while I was travelling, an announcement arrived in my email about an 80-minute program of audio episodes of ZBS radio plays. Back in June, Meatball Fulton, the creator of Jack, Ruby, The Android Sisters, and many others, was asked by Hear Now: The Audio Fiction & Arts Festival to put together a retrospective to present at the festival. The Retrospective is now online, and you may go directly to the SoundCloud 80-minute audio track with commentary by author and producer, Meatball Fulton. This is luscious stereo audio, and it is worthy of better sound than your computer speakers will produce. I recommend pumping it through a good hifi system or, the way I prefer, listen with a great headset. No, not a gamer’s headphones — if you are looking for quality sound reproduction, perhaps pick something from the Grado catalogue where even the low-end cans sound great and are not expensive.